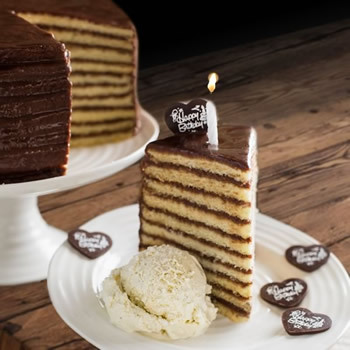 Make this the best birthday ever with the gift of an Authentic Smith Island Cake. All Birthday Cake Packages include everything you need for the perfect birthday surprise! Ordering a birthday cake online couldn't be easier. The ice cream is guaranteed to arrive frozen and delicious! Package features your choice of 9-inch Smith Island Cake shipped in a recyclable cake box, 4 pints of gourmet, all natural ice cream, 12 candles and 5 "Happy Birthday" chocolates (serves 12-16 people). Package features a 6-inch Smith Island Cake, 2 pints of gourmet, all natural ice cream, 12 candles and 5 "Happy Birthday" chocolates (serves 7-9 people). The Smith Island Baking Company’s mission is to help Smith Islanders share their unique treasures with dessert lovers everywhere. Ever since the 1800’s, Smith Island Cakes have been a symbol of fellowship and community. Each year, when the watermen would go out for months at a time in the autumn oyster harvest, their wives would send Smith Island Cakes to help them feel together, even when they were apart. And when the men would safely return, Smith Islanders would cap off their community feats with more Smith Island Cakes. Over the centuries, the Smith Island Cake has become a symbol of celebration, whether celebrating together or celebrating apart. People love to celebrate those they love, and there is no better occasion to celebrate loved ones than on the anniversary of their birth. Whether you are together, or apart, our customers tell us there's nothing better than surprising a friend, loved one, or lost acquaintance with that personal touch of a delivered gift to let them know you care. A note, a card, a phone call, and a gift. Anything to let them know that another year has passed, and you're happy to have shared it with them. And when you can be together on birthdays, there's nothing like a birthday party. Candles and cake. And togetherness. All to celebrate one more year of being together. So the next time you and your loved ones gather to toast a birthday, please think of us, order a birthday cake and give us the opportunity to send one of our made from scratch creations on your behalf. Our mail order birthday cakes are gourmet works of art. They are wonderful to look at, wonderful to eat, and they are always unconditionally guaranteed. For a beautiful Smith Island birthday cake, order online and you’ll truly have a celebration to remember. When friends gather, we are always honored to be a part of it. We always say we don't make tens of thousands of cakes: we make one cake, for one party, tens of thousands of time. It is that personal touch in our mail order business that lets you know that serving you is a privilege. We love what we do, because we love helping people celebrate.